Tree spikes custom made in a variety of materials and colours, they can be used in flower beds and planters to commemorate a special event or the loss of a loved one. 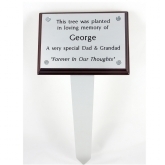 Larger Commemorative and Memorial tree spikes can be manufactured from 3mm thick satin stainless steel with a spike welded to rear for planting into ground., As these are made to order in any size, with any amount of wording and can also incorporate a symbol or a grey scale picture of a special place or an image of a loved one , please give us a call to discuss your requirements in greater detail. 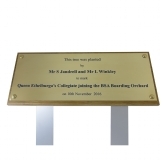 We can also produce tree spike plaques in aluminium which are mounted onto a wooden backing board and have an aluminium spike screwed to the rear of the board. 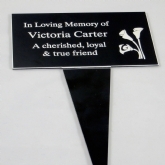 We can also supply the plaque and backing borad for you to attach to your own post if required.